There is nothing fundamentally different about lighting large spaces over small ones, but big rooms do come with their own unique qualities and issues. 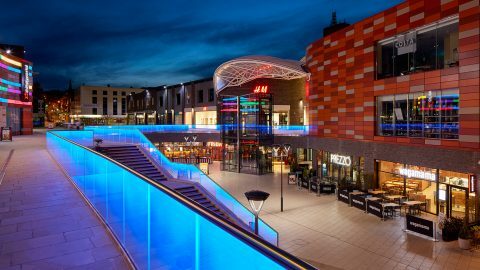 It used to be that big spaces were thought of as industrial or warehouses, but more recently, they have begun to include retail spaces, activity centres, multi-purpose spaces, and even impressive lobbies. Traditionally, the warehouses and industrial space drew the short straw when it came to lighting, looking for both functionality and cost-effectiveness over style and ambiance. However, in more recent times lighting designers have paid much more attention to these big spaces to analyse how the light falls and all the associated complications. Big spaces are commonly lit using high-brightness fixtures causing glare for workers and shoppers alike. Large spaces can cause issues with light distribution. Improper lighting creates a lot of work for the eye to manage causing tired and strained eyes. Larges spaces from hotel lobbies to storage warehouses tend to operate 24 hours a day, seven days a week and usually have high ceilings. This means long burn hours and regular relamping. Whilst the costs of bulbs and LEDs are coming down, high ceilings usually require specialist lifts and multiple man hours making the cost increase substantially. Similarly, when lighting maintenance is not conducted regularly, it can make spaces look neglected. Light intensity decreases over distance and so lighting that is mounted twice as high is one fourth as bright. As such, lighting used in large spaces produce a lot of lumens in order to light the room to a suitable level. In order to produce such light, it is recommended to use light sources with high lumens/W rating. However, as these same buildings are increasingly regulated in terms of their energy usage, it is becoming increasingly challenging to light them efficiently. When choosing luminaries for large areas, the use of diffused lights instead of point sources can reduce the often unpleasant glare. When working with big spaces, lighting designers pay close attention to the spacing between mountings as properly spaced lighting helps to light areas evenly (if this is the goal). Even lighting reduces the work the eye has to do to adjust to the various areas. This is important in working, shopping and learning environments. Sometimes clever lighting is more in the painting than in the luminaries. Lights that are placed to bounce off walls can offer a great source of illumination. However, it goes without saying that the surfaces need to be painted in lighter colour value in order to have sufficient reflected light. 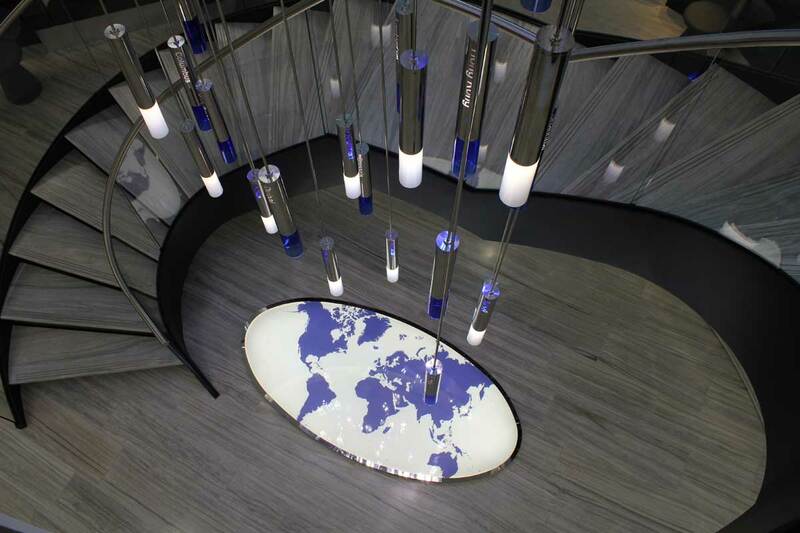 As more and more lighting products have increased lifespan, we are seeing the design shift to accommodate them. Many fluorescent and HID sources can last over 20,000 hours, particularly on longer burn cycles. Induction light sources have also been known to operate 100,000 hours. The LED and OLED market is currently making huge leaps in efficiency, whilst the production costs continue to decrease. Of course, the most efficient tool for lighting big spaces, particularly during the day is daylight. Skylights and clerestories increase light during daylight hours, as well as improves the color and aids productivity. However, if you do not have access to daylight, clever use of LED lighting in key areas can not only be effective but also energy efficient. Overall, the lighting of big spaces is an exciting challenge that The Light Lab enjoy tackling. 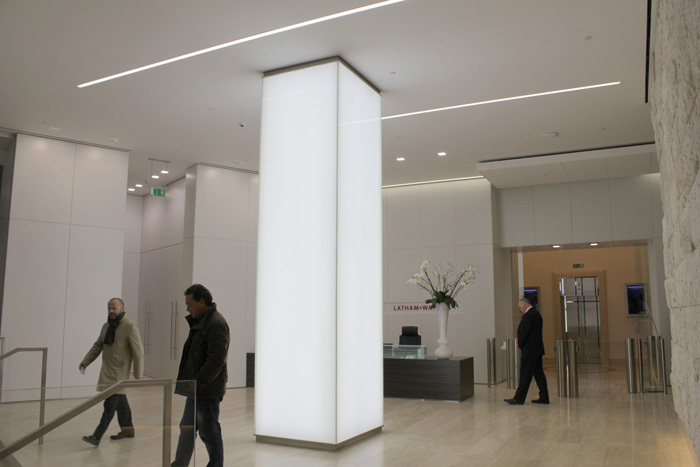 The team has implemented a wide range of big space lighting solutions from Penn Station in New York to breathtaking lighting features in London’s Broadgate Quarter.